Chinese embroidery has a rich and colourful history with evidence of silk dating the early Shang Dynasty (1500 - 1050 BC). �Its development can be traced through the different historical periods and dynasties of China, each of which left its mark and added to its evolvement. 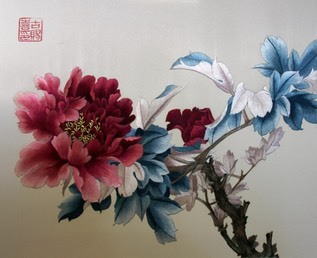 • ‘Yue’ embroidery from Guangzhou area. While there are significant overlaps in techniques employed, these four styles are distinctly recognisable. Their development has been greatly influenced by local geographic environment, traditions and customs as well as other artistic features of the area. �In history, ‘Su’ embroidery was noted as the choice of embroidery for the royal wardrobe and wall decoration for the imperial household. ‘Su’ style of embroidery is the style favoured by Margaret. �It is well known for its elegance and delicate needlework techniques; and is the epitome of ‘painting with silk thread’. For those who are interested in acquiring practical skills in Chinese embroidery, please view the�Curriculum and Class dates.